LOCATION.--Lat 40°59'57", long 73°59'21" referenced to North American Datum of 1983, River Vale Township, Bergen County, NJ, Hydrologic Unit 02030103, on upstream right bank at bridge on Westwood Avenue in Rivervale, 1.5 mi upstream from Pascack Brook, 4.1 mi downstream of Lake Tappan, and 4.6 mi upstream from Oradell Dam. GAGE.--Water-stage recorder with telemetry, crest-stage gage, and concrete control. Datum of gage is 22.51 ft above NGVD of 1929. REMARKS.--Records fair, except for estimated discharges, which are poor. 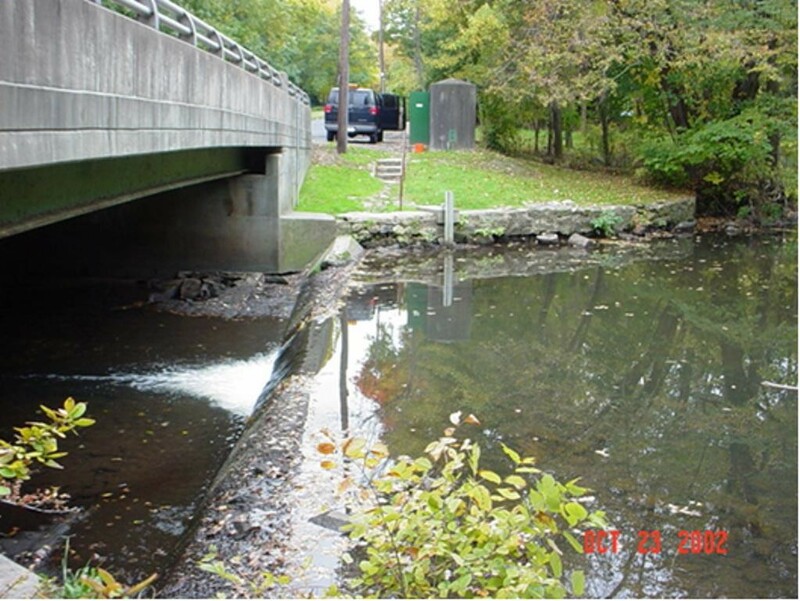 Flow regulated by DeForest Lake (since 1956) and Lake Tappan (since 1965, see 01376950). Diversions from DeForest Lake and Hackensack River at West Nyack, NY, for municipal water supply. EXTREMES FOR PERIOD OF RECORD.--Maximum discharge, 4,660 ft3/s, Aug 28, 2011, gage height, 12.26 ft; minimum discharge, 0.0 ft3/s, Jan 16, 1970, affected by regulation from upstream. PERIOD OF RECORD.--Water years 1962, 1964 to current year. National Weather Service flood stage for this gage is 5.5 ft.
Reservoir releases from Lake Tappan are included in the flow at this gage.